It’s October 21, 2015 – the day that Marty and Doc Brown travelled to the future in Back to the Future Part II. There’s been plenty of articles appearing on the internet today, many of them lamenting our lack of hoverboards, others reflecting on what aspects of Marty’s 2015 actually came true. For many people of my generation, this was the what the future would look like. I used to write stories about hoverboards as a child and looked forward to the day when I would finally own one. I imagined zipping through the clouds in my flying car. But the reality of 2015 is completely different. 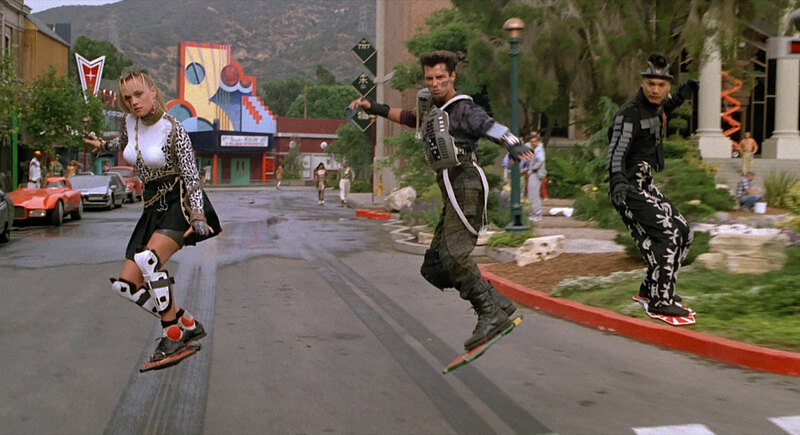 We don’t have hoverboards, self-lacing shoes, or flying cars. Jaws 19 is mercifully nowhere in sight, a pizza can’t be hydrated in mere seconds, and lawyers are yet to be abolished. So I can’t help but feel a little disappointed that the dream hasn’t come true. I wish this is how I’d travelled to work today. Alas. However, I don’t think that director Robert Zemeckis intended his techno-utopian vision of the future to accurately predict the real world of 2015. Like most science-fictional visions of the future, it was more of a commentary on the present-day – in this case, the late 1980’s. Zemeckis’s jokes about the Jaws franchise and the Cubs’ World Series win delighted the audience for their absurd exaggerations of contemporary pop culture. And most of the futuristic technology that Marty encounters are mere plot devices to enable him to better move through the future world. (Though, damn it, I still really want that hoverboard.) 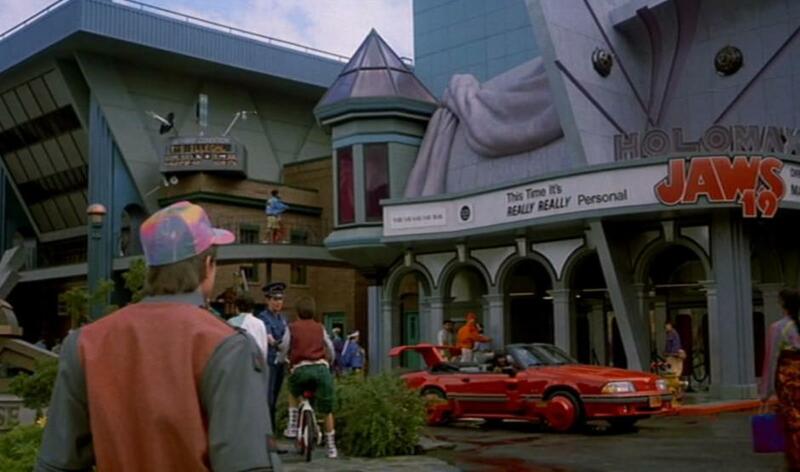 The movie’s real concern about 2015 is the state of the McFly family. Doc Brown brings Marty to 2015 to prevent his children from making mistakes that will destroy the family. And that’s the theme to which the Back to the Future films keep returning: the construction and preservation of a utopian existence for an American family. 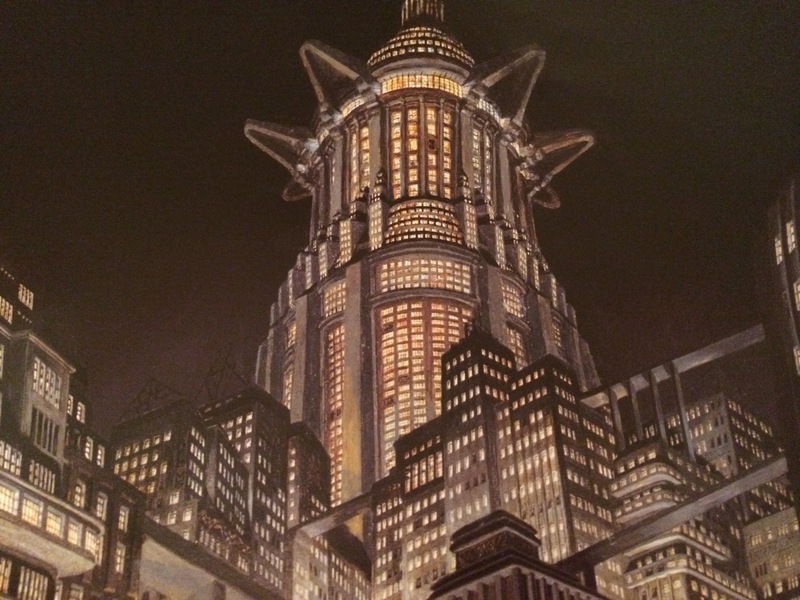 The BTTF trilogy is redolent in utopian and dystopian imagery. Marty’s journey back and forth in time becomes a quest to undo his mistakes (generally his interference in the timeline) and to prevent the subsequent realization of dystopian futures. At the heart of this timeline is the McFly family. Around their fortunes, Hill Valley is configured as either a utopian or dystopian space. By the end of the trilogy, the preservation of the town itself is dependent on the McFlys. Still one of the coolest movie posters of all time. In the first film, Marty’s family live a typically suburban life. His parents are tacky and inattentive. His father is being bullied by Biff Tannen, and we learn that Uncle Joey is in jail. When Marty travels back to 1955, he accidentally prevents his parents from meeting and spends the rest of the film correcting this mistake, with the threat that he’ll be erased from time if he’s not successful. Biff’s intentions towards Marty’s mother, Lorraine, hint at a dark future if George McFly is unsuccessful in wooing her (and, indeed, a variety of this future is visited in the second film). In a moment of uncharacteristic bravery, George stands up to Biff and manages to attract Lorraine. Marty’s future is saved. Yet when he returns to 1985, he discovers that the timeline has been changed. George’s defiance of Biff has created a distinctly utopian existence in 1985, where Marty’s parents are successful and attentive. George is a published author, and Biff is reduced to a fawning sycophant. Marty has lifted himself out of the trap of suburbia. Back to the Future Part II is a little more complex with its depiction of this theme. It begins with Marty and Doc Brown travelling to 2015 to prevent Marty’s children from going to jail. 2015 is initially constructed as a technological utopia, but we soon begin to see the cracks. Griff Tannen (son of Biff) is a bully to the hapless Marty Jnr. The older version of Marty has given up on his dream of becoming a rock star after a car accident, and he’s soon fired from his job. And although 2015 may look shiny and impressive, it’s a form of torture for Marty and his family. 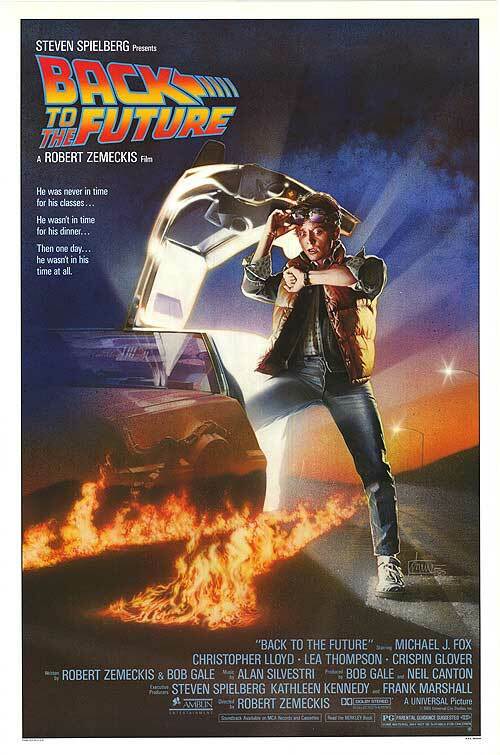 (The solution to this car-accident-dystopia actually lies back in 1985, and isn’t visited until the very end of the third film, which is exceptional storytelling by Robert Zemeckis.) However, the 2015 version of Biff then steals the DeLorean and travels back to 1955 to give his younger self a copy of the sports almanac, heralding an even bigger crisis. The alternate 1985 which this creates is the clearest example of a dystopia in the entire franchise. Biff is married to Lorraine and his financial empire rules over Hill Valley. The clock tower has been turned into a casino, George McFly has been murdered, Doc Brown has been committed. Bike gangs run rampant across the city. Biff has even exerted a form of control over Lorraine’s body, with the addition of her breast implants – an insidious form of ownership over a body. It is the ultimate dystopian nightmare for Hill Valley, all precipitated by the interference of Marty and Biff. It is the squabble between the McFly and Tannen families played out on a larger stage. Marty then discovers how Biff changed the timeline, and he and Doc Brown travel back to 1955 in order to fix it. They are fighting not just for the future of the McFly family, but for the sanctity of Hill Valley. For the first time, the story posits that the preservation of the McFly family has a larger impact on the surrounding environment. The third film is my favourite film in the trilogy. It’s not just the Western aesthetic: it’s the inversion of the jokes from the first two films and the conclusion of the plot lines that always draws me in. And I love trains. This is my favourite scene in the entire trilogy. 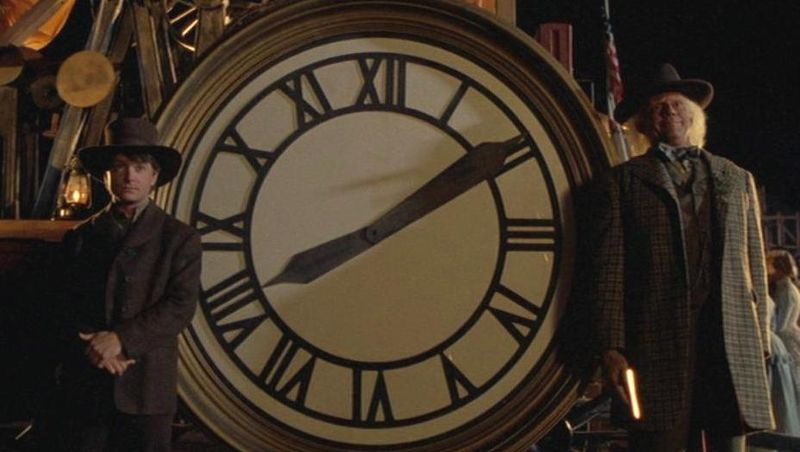 It represents Marty’s significance in Hill Valley’s history. And I love the look on Doc Brown’s face. The Hill Valley of 1885 is a frontier town at the beginning of its existence, and it is here that the struggle between the McFlys and the Tannens has its greatest urgency. The events that happen in 1885 decide the entire future of Hill Valley and whether it becomes a utopian or dystopian space. Mad Dog Tannen’s lawlessness threatens the community. The Marshal can’t control him; his gang effectively owns the town. Although Marty’s first impulse is to run away from a final confrontation (and catch the train to time travel back to 1985), the story demands a resolution. If left unchecked, Mad Dog and his descendants will be allowed to rule over Hill Valley for the rest of time. We’ve already seen what a future controlled by a Tannen could look like; this dystopia could spread across the entire timeline. So Marty steps up and defeats Tannen. Even better, he refuses to draw his gun and opts for a non-violent solution, even as Mad Dog calls him “yellow.” At the same time as Marty saves the future of Hill Valley, he learns to overcome his own flaws. The end of Back to the Future Part III wraps up the lingering threats of dystopias. Returning to 1985, Marty refuses to participate in a car race, thus saving himself from the accident that would potentially end his rock star future. He has guaranteed the success and survival of his family. And Hill Valley has equally been spared from dystopia. In The Encyclopedia of Science Fiction, Peter Nicholls wrote, “The overall vision of the three films is of a static paradise poised dangerously above the dark abyss of uncertainty and change.” That’s really what drives these films – the pursuit of the idealized version of Hill Valley, where Marty’s family are successful. His Campbellian Hero’s Journey has taken him from the tacky listlessness of suburbia to a place where his family claims prominence in their community. Utopia is assured. Writing this post has reignited my love for this trilogy and multiplied my respect for Zemeckis as a storyteller and film-maker. So I intend to enjoy Back to the Future Day. And I’ll keep a hopeful lookout for a teenager in a DeLorean. I think the trilogy reflects a tremendous thought into detail and continuity over the decades to produce a superb plot.